Real LIVE Practice-Labs allow you to experience practical application of course concepts in authentic environments without purchasing expensive software or equipment. Try out your new skills as you learn! The VCP5-DCV (5.5) Practice-Lab will provide you with the necessary platform to gain hands on skills in vSphere 5.5. By completing the lab tasks you will improve your practical skills in installing and configure vCenter server, configuring VMware ESXi, securing vCenter Server and ESXi, configuring vNetwork standard switches, configuring vNetwork distributed switches, configuring vSS/vDS policies, managing VMFS datastores, managing shared storage for vSphere, create and deploy Virtual Machines, create and deploy vApps, managing VM clones/templates, administer VM's / vApps, manage VMware clusters, implement VMware fault tolerance, manage resource pools, patch management, troubleshooting, monitoring and server alarms. Becoming proficient in these tasks will help you understand the objectives and competencies required by the VCP5-DCV (5.5) certification exam. Using the Real Practice-Lab to its full potential will help you develop your skills in either becoming a VMWare administrator or help you develop your current skill level. Once you have used the lab for either 25 / 50 or 100 hours we will acknowledge this achievement by issuing you a certificate. This can be validated by potential employers or managers alike. Configure VMware ESXi: As more and more organisations adopt virtualization technologies being able to effectively deploy and configure these products is fundamental to their success. Using the exercises and devices in your Real Practice-Labs servers you will be configure the core management components of VMWare VSphere 5.5 including DNS and routing of the management interface as well as other advanced memory, processor and licensing settings. Upgrading host and guest components: Using your Real Practice-Lab environment will enable you to carry out upgrades to elements such as VMFS versions, distributed switches, guest hardware versions and VMWare tools. Even if you have experience in previous version of VMWare ESXi it is always good to test these upgrades in a safe working environment so that you become comfortable with the process. Securing vCenter Server and ESXi: Managing the security access of your VMWare environment is vital to ensure that rogue guests cannot be created and stop VM sprawl from happening. Using your Real Practice-Lab you can evaluate all the security options available to you. These include the ESXi firewall, lockdown mode, network security policies and controlled user access. Once you have tested and evaluated these features you will be in a position to define and deploy a security policy in your own organisation. Managing network components in ESXi: Having an understanding of VMWare networking is extremely important to providing a environment that is both functional and secure. Using you Real Practice-Lab you have the ability to manage / edit standard and advanced networking components. You will discover how to create and manage vNetwork Standard Switches, vNetwork Distributed Switches, vSS and vDS Policies. Virtual Machines and vApps: Creating and managing guest operating systems is the most common task for anyone administering a VMWare environment. Understanding how to deploy, manage and troubleshoot virtual machines is a crucial part of the job. Using your Real Practice-Lab you will be able to create, deploy and administer virtual machines and vApps, manage virtual machine clones and templates. You will also carry out more advanced topics like create and administer resource pools and migrate virtual machines. Practicing these tasks will assists you in becoming a more proficient engineer. Maintain availability: One of the potential downsides of virtualization is having your guest operating systems dependent on a single piece of hardware. In order to mitigate this risk you can build a fault tolerant environment with the use of some features built-in VMWare VSphere. Using your Real Practice-Lab you will have the ability to create and configure VMware clusters and backups which help you plan for a resilient platform in your own organisation. Troubleshooting and monitoring: Being able to identify and respond to problems before they arise is the mark of a proactive engineer. Using and configuring the tools available to you makes this function much easier. 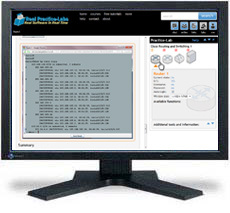 Using your Real Practice-Lab you will be able to perform basic troubleshooting functions as well as configuring alerting within Virtual Center to assist you in identifying and alerting you to problems.